No. 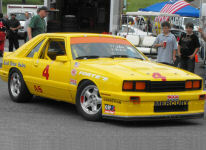 I sold it at the Runoffs. Sorry. Hi Mr. Wheeler. I was wondering if the t-10 you had for sale is still available. Interesting. The issue went away after the race. I expect some worn parts in the system, but this looks too cool. This will fix your brake binding issue. I had it on my AS car and my new Vintage 510. Jim, working with Carl Bush, cuz i split 3 ultra lite calipers this year, 2 at WGI last week. are you using the radial mount or 2 bolt Superlites? Do you have any idea what hoses to use with them , i drilled a hole through the inner fender for the brake line so it isn't in stock location, and was woundering if you use a 90 deg brake hose off the caliper to the 3an/3/16 line that runs to M/C. also are you using the H compound up front or the A compound. Things are starting to get better! The car still needs a motor and I need back surgery so I'm probably out for the year but I can't wait to get back out there with you guys! My new wife is even excited about the prospect. She got a fairly complete indoctranation at the double at Blackhawk last season. First time at the track for her and we raced in the rain on Saturday, I popped an oil line in Qualifying and stopped right in front of where she was watching with the car on fire and blew up the motor on Sunday. Liz is actually excited about the next outing! She appears to be eveerything I was looking for! And it only took 4 tries. take this as tongue in cheek. I was going to post in for sale, but I think some guys would take offense. Keep up the good work, I know what it takes to do what your doing onthe CRB and ASAC. FYI, I have a spare Gen 3 roof if you need one! All the parts you need to go fast but complained they are too expensive. •	Must have recently won the lottery to buy faster parts and pay off ASAC and CRM for rule changes on eone else wants. •	Has to run at least 10 races a year so all the parts will be wore out. •	Loves to drive and can tell stories of when everyone drove instead of running their mouth at redline on internet fourms. And last but not least, can carry 2 to 3 spare rear deck lids to all races he attends. Jim, I was just looking over some old posts and came across “Rear Wheel Hop”. I had posted that I had installed an adjustable torque arm on my Camaro and you wanted to know where I found the item. I know this is an old post but thought you might still want to know where I purchased the arm. The web site is www.spohn.net hope this helps. FYI, GM does not make a small bore (3 3/4) bow tie block. Dart does!